1 Clauss, Manfred, The Roman cult of Mithras, p.xix. 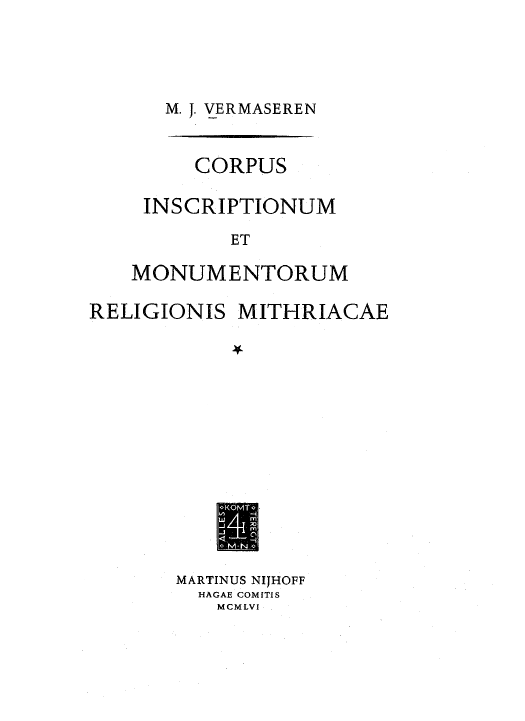 "Between 1956 and 1960 Maarten J. Vermaseren published his Corpus Inscriptionum et Monumentorum Religionis Mithriacae, a new collection of the epigraphic and monumental evidence, which had become necessary owing to the steady increase in material over the intervening years. In Mithraic studies Vermaseren rapidly acquired a status similar to Cumont's, though he never became so rigidly dogmatic. Today his two volumes provide access to the great bulk of the archaeological evidence, and in fact constitute the standard work in the subject." 2 A. D. Nock, Review of the CIMRM, Gnomon, 30. Bd., H. 4 (1958), pp. 291-295, on JSTOR. p.291: "For sixty years all study of Mithraism has been based on Cumont's masterpiece; this new collection of the monumental evidence bears a fitting dedication, 'Francisco Cumont qui vita sua exemplum dedit'. Cumont, with the generosity which matched his genius, gave every help and encouragement to Vermaseren." 3 Martin P. Nilsson, Review of CIMRM, American Journal of Archaeology, Vol. 62, No. 2 (Apr., 1958), pp. 243-244, in JSTOR.